Protesters march in support of Palestinians killed in Gaza and the West Bank. 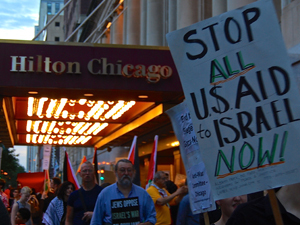 Attendees of the Jewish United Fund “Chicago Stands With Israel” fundraiser at the Chicago Hilton last night were met with over 250 protestors picketing outside as well as a die-in representing the continued Palestinian civilians deaths in Gaza. What they didn’t expect was multiple protestors from Jewish Voice for Peace and Jews for Justice in Palestine inside the venue disrupting the speeches of Mayor Rahn Emmanuel and former Israeli ambassador to the U.S. Michael Oren. 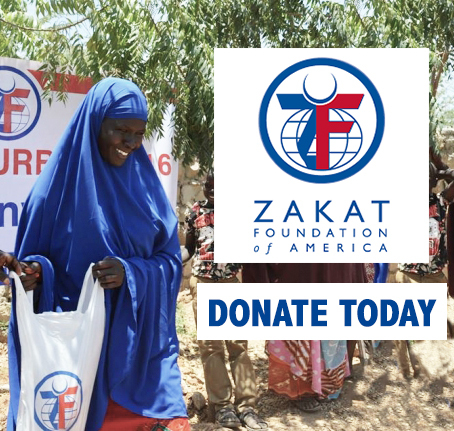 prolonged conflict with Hamas has created intense humanitarian needs in Israel”. The Students for Justice in Palestine (SJP) – Chicago organized a die-in on the sidewalk in front of the main entrance to the hotel to highlight the over 2,100 (including over 500 children) killed and over 10,000 injured in Gaza since the assault began on July 8th. News media coverage has been scant since the ending of the last ceasefire on August 20th, so the activists were also emphasizing the 30 Palestinians including 10 children that have been killed by Israeli forces over the last two days. 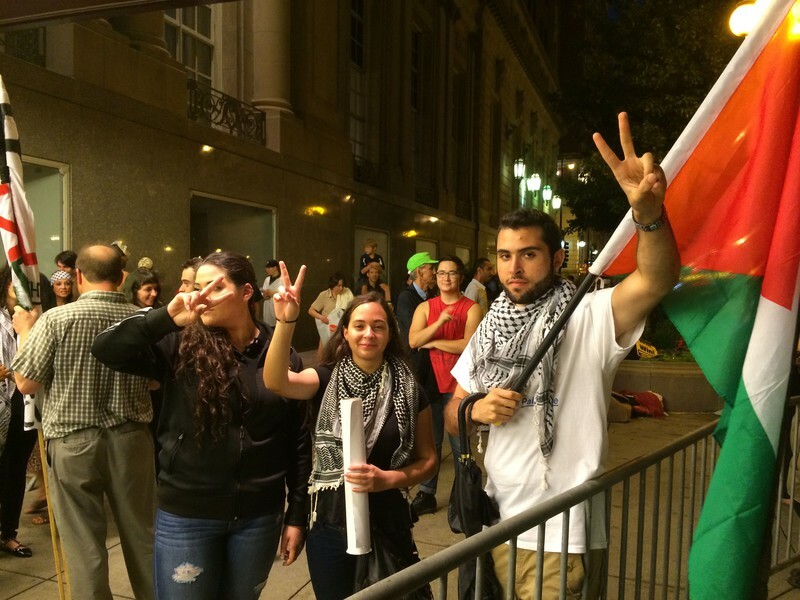 Throughout the event, protesters organized within the last three days by the Chicago Coalition for Justice in Palestine marched and chanted outside the Hilton in support of the Palestinians in Gaza and also those killed and injured in the West Bank. Late yesterday, it was announced that Mayor Rahm Emmanuel and Senator Mark Kirk were attending the function along with the keynote speaker, Michael Oren, former Israeli Ambassador to the U.S. A number of activists from Jewish Voice for Peace (JVP) – Chicago, Jews for Justice in Palestine, and the Chicago Anti-War Committee interrupted all of the speakers multiple times. The Electronic Intifada has published a video of the activists disrupting the event. Two JVP-Chicago activists interrupted Mayor Rahm Emmanual as he was announcing a $5,000 gift from him and his wife to the Israel Emergency Fund. The JVP activists stood up shouting “We are Jews, Shame on You! Stop killing children now!” A sign they held was taken away by an attendee and they were threatened with arrest unless they left. Michael Oren’s speech was also disrupted multiple times by activists holding a banner and chanting. All of the activists were expelled from the fundraiser without arrests. As with many of the protests about Palestine in Chicago over the last month, this one was no different in having little local media attention. There was only one local outlet, CBS-News, who was there filming and a scan of the local news media shows no reports at all including CBS news. Even the fact that Mayor Rahm Emmanuel had decided not only to attend a high-profile fundraiser for Israel, but also to give a speech about a sizable donation he was making to the Israel Emergency Campaign does not even merit a few lines in local coverage. Since the ending of the last ceasefire, the main media outlets have moved on to cover important stories like Ferguson and Iraq, but the complete lack of reporting on the continued deaths and injuries of Palestinians in Gaza is deafening. It has been up alternative media like the Electronic Intifada, Palestine in America, and the Chicago Monitor to provide the coverage of issues that clearly matter to thousands of Chicagoans. To all Chicagoan remember to vote then ext Mayoral election every one should vote not let Rohman Manuel be elected again, we have thousands of voters and should go out in masses to vote.we have to get involved .